Best Practice Exchange in First Aid starts | SAMARITAN INTERNATIONAL e.V. 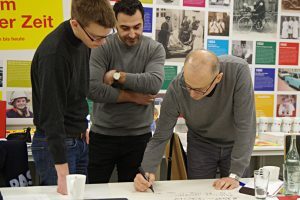 From 24-26 January 2019, the FACET project held its first exchange workshop and kick-off in Cologne, Germany. 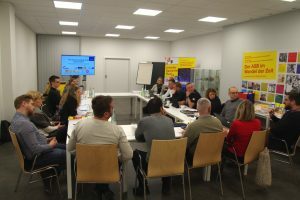 German project partner ASB hosted the meeting at the facilities of its North-Rhine Westphalia state branch. Representatives of all partner organisations came to the kick-off. FACET stands for “First Aid, Civic Engagement, Training” and is an Erasmus+ funded Strategic Partnership to exchange best practices in first aid / volunteer education among the participating organisations: ANPAS, ASB, ASBÖ, ASSR, CDI, LSA, LSB, and WK. The meeting started off with administrative issues that all project partners have to observe as part of the project and a recapitulation of the tasks for the coming two years. The participants from Macedonian partner organisation CDI, which is planned to establish first aid as part of its volunteer training portfolio over the course of the project, held a brief introduction on the status quo in North Macedonia. Then the group began the best-practice exchange that is scheduled to make up the first half of the project. Experts from ASB introduced the participants to aspects of the German volunteering system and the volunteer management of the organisation. A first best practice was also presented: ASB’s student first aiders – a first aid service at secondary schools which is done by volunteers and usually also trained by volunteers. These presentations were all followed by lively discussions on comparable efforts and applicability in the other participants’ organisations as well as group work on the current national regulations on first aid training in different countries. Over the course of the project all partner organisations are expected to contribute to a brochure on practices in volunteer-based first aid. Their presentations will follow at the next exchange meetings. The next exchange workshop is planned to take place in North Macedonia in June. More information about FACET is available on the project website.